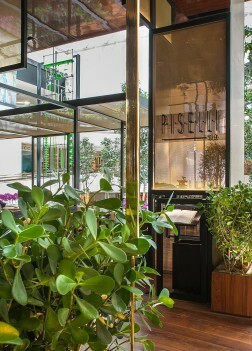 Situated in the heart of Sao Paulo’s most renowned interior public space Piselli is conceived as a “Restaurant in the Garden”. 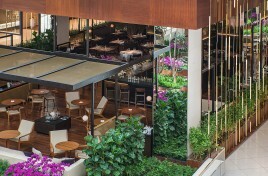 The high-end dining establishment is nestled within a vegetal oasis with an outdoor atmosphere enhanced by sunlight and natural ventilation. 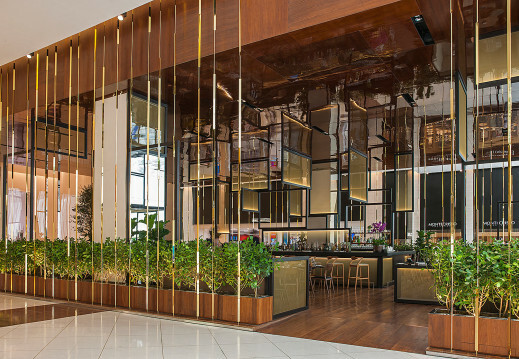 The challenge of designing a “restaurant without walls” was answered by creating a magical veil of suspended floor-to-ceiling strands composed of polished gold-plated solid brass bars that vertically wrap the periphery of the 6-meter high restaurant. 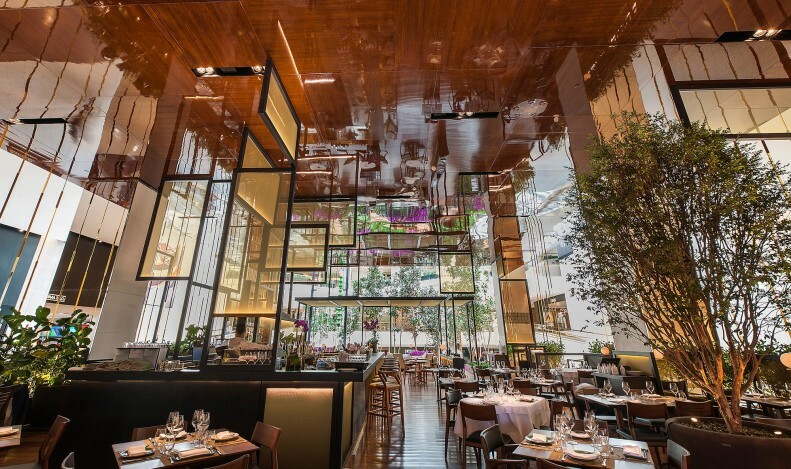 These ethereal chards of reflected light appear as luminous golden threads that defining the restaurant’s volume and luxurious identity as an elegant Architectural treasure chest. 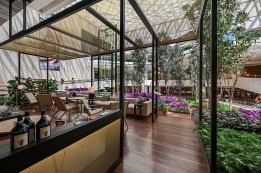 A discrete garden path leads guests to an exclusive entry and covered garden terrace lounge with solid wood furniture and an extra-long 7-meter beige leather sofa. 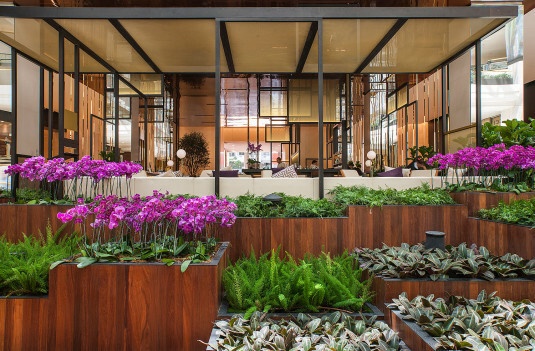 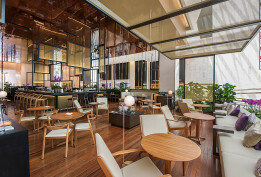 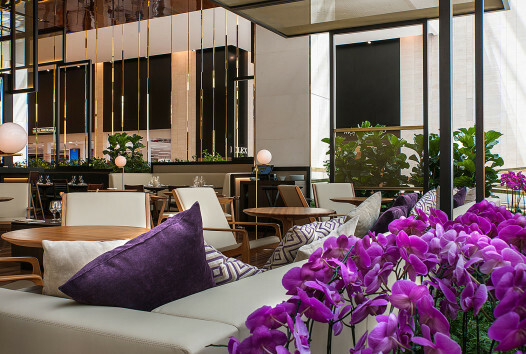 The warm, rich interior ambiance is framed by a monumental floating ceiling of high polished lacquer smoked cedar wood paneling that dramatically reflects the lush vegetation and flowers adding to the illusive and ephemeral enchantment. 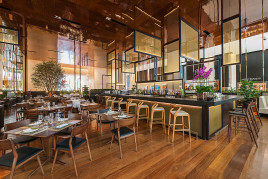 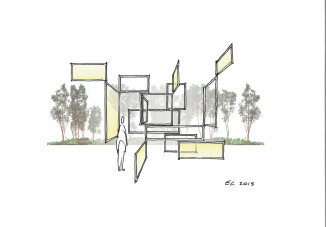 To create a variety of intimate and cozy dining areas Eric Carlson spatially divides the restaurant with a sculptural collage of orthogonally composed floating wood frames filled with a delicate luminous woven brash mesh.